For reasons unknown, the previously console-only Enslaved: Odyssey to the West was recently ported to PC, popping up on Steam as a ‘Premium Edition’ (some 3 years after its original release). I was excited to check it out – being a PC guy through-and-through, I never got the chance to try it when it was first released, and I always thought it looked interesting. 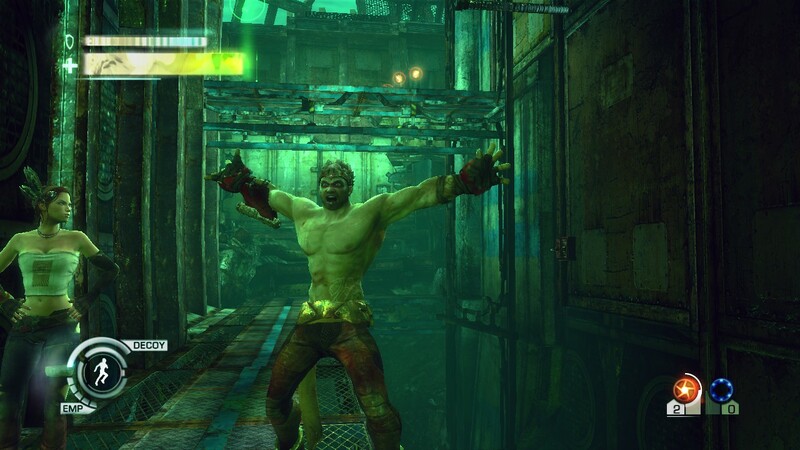 My curousity only grew after playing developer Ninja Theory’s latest offering, DmC, earlier this year, a game that I was hugely impressed by. 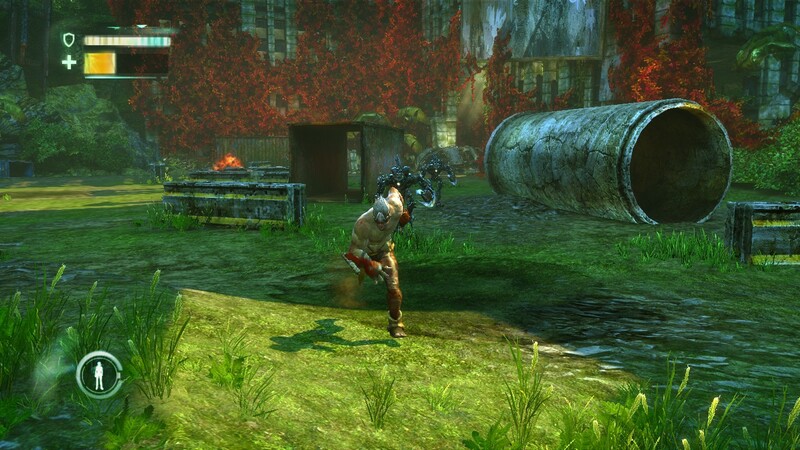 Enslaved is set in a post-apocalyptic USA, some 150 years in the future. You play Monkey, a sort of Tarzan of the apocalypse; you are forced, by use of a ‘slave headband’, to accompany and protect a young girl named Trip as she makes her way through the wilderness back to her home. In your way are hordes of ‘mechs’, deadly robots seemingly obsessed with murdering humans. Gameplay consists largely of a mix of fighting robots and traversing the environment, with some stealth sections, simple puzzles, and a few set-piece action scenes thrown in for variety. The traversal is pretty rudimentry – though satisfying enough, it consists mostly of just holding in the right direction and pressing a button. The combat, however, despite at first seeming like a basic button-mashing affair, has surprising depth and variety. It’s all about crowd-control – you can fight a robot 1-on-1 easy, but you can’t let them surround you or you’re toast. This forces you to use a system of sweeps, stuns, dodges and ranged ‘plasma blasts’ to keep out of harm’s way. It calls for both quick reflexes and tactical thinking – I played on Hard, and often found myself really having to think out my approach to each combat scenario in order to succeed. What really carries the game, however, is its characters. Monkey and Trip, and comic relief Pigsy, are incredibly well-realised. Performances are excellent, both in voice-work and in mo-cap – with Andy Serkis on board (the man behind Gollum), both directing and portraying Monkey, it’s perhaps not surprising. Facial expressions are especially brilliant, animated with enough fidelity for the actors to convey subtle and genuine emotions on the character’s cartoonish faces, something very rarely seen in video games even now. The writing pulls it all together, creating interesting and believable dynamics between the characters. Monkey and Trip’s relationship is especially good – Monkey, forced into servitude against his will, slowly comes to see exactly how in need of his help Trip is, while Trip balances her guilt at enslaving him with her desperation to survive. Even when the story drags, the characters keep you invested. The visual designs of the characters compliment their personalities perfectly – indeed the art-style and animation throughout is superb. Despite its now advanced age, the game still looks absolutely beautiful. In contrast to the brown wastelands that have become cliche in gaming, Enslaved‘s post-apocalypse is vibrant and colourful – lush greenery grows over the ruins, warm sunlight beams through the trees, and even your robot foes are painted in bright primary colours. It’s hugely refreshing to explore an apocalyptic world that doesn’t feel the need to be unrelentingly harsh and grim – despite its danger, the wilderness feels cheerful, like it would actually be a nice place to live if only all these bloody robots would bugger off. It’s unfortunate, then, that this is only the most basic of ports – no graphics options to speak of. Given how little fanfare has accompanied its arrival on PC, this is perhaps not surprising. Go into this expecting a ‘console experience’ on your PC, rather than all the bells and whistles you’d expect of a current PC game – by the same token, you’ll want to use a gamepad rather than a mouse and keyboard. The port does come bundled with the game’s DLC spin-off, Pigsy’s Perfect 10, a piece of content so good I decided to review it separately. 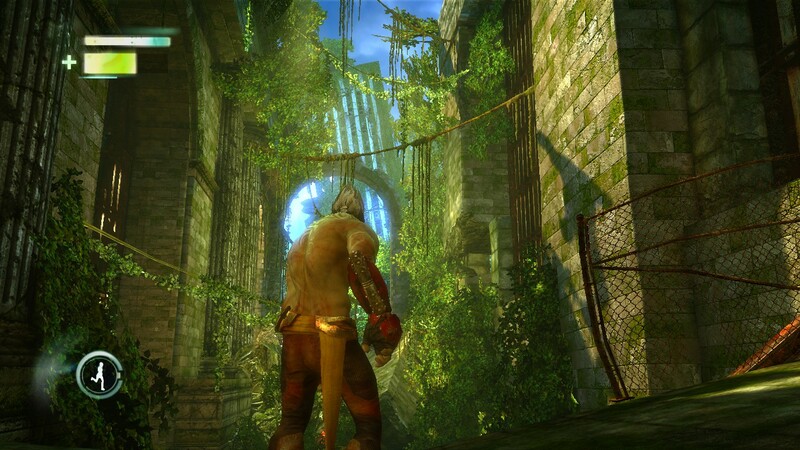 Enslaved was sadly overlooked in its own time, undermarketed and ultimately failing to make the sales it needed to prove its worth. I’m not sure what’s motivated its re-release on PC, but I sincerely hope the game sees something of a renaissance on the new platform. 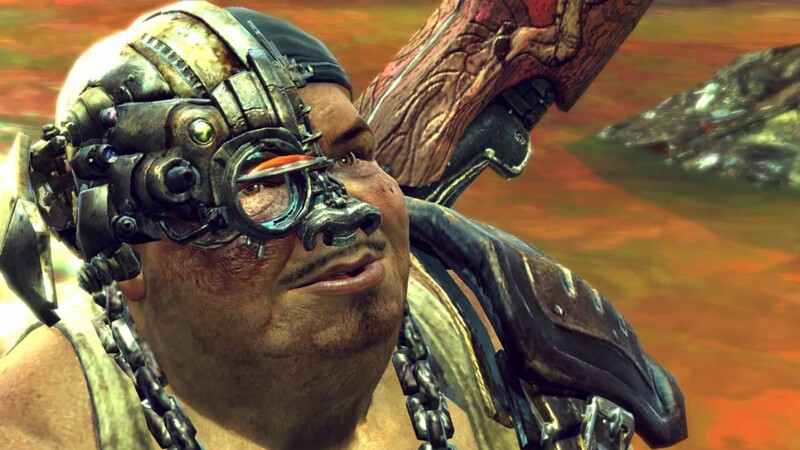 I’m not sure I can name a game with better character work in the 3 years since its debut – it’s worth a look for that alone. Beautiful aesthetics, original ideas and solid gameplay are just the icing on the cake.